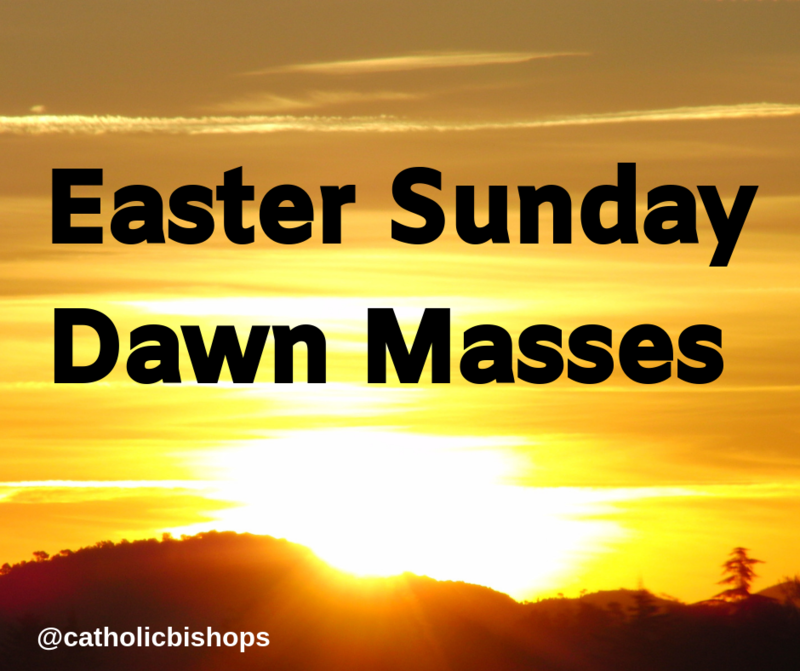 Many Irish dioceses and parishes will host dawn Masses on Easter Sunday morning. Dawn Mass is a very spiritual opportunity to celebrate Mass while watching the dawn break over the countryside. There will be a dawn Mass in Clonmacnois Monastic Site (Old Cathedral) at 5.30am on Easter Sunday morning. The Parish of Ardagh/Moydow will also host a Dawn Mass at 6.00am in the village of Ardagh, Co Longford. Woodford Parish at 5.30am at the Grotto at Woodford Bay. Clontuskert Parish at 6.00am in Clontuskert Abbey. Ballinakill Parish at 6.00am in Ballinakill Park. Ballymacward Parish at 6.00am in Clonkeenkerril Cemetery. Taughmaconnell Parish at 6.00am in Taughmaconnell Cemetery. Loughrea Cathedral Parish at 6.00am on the Lake Shore at Long Point Loughrea. A Dawn Mass will be held in Macroom, Co Cork at 6.00am. The Mass, which will take place in Macroom GAA Car Park, is organised by the parish council. All are welcome and are advised to wear warm/weather appropriate clothing. The Parish of Doneraile will celebrate a Dawn Mass at 5.45am on the Old Court Cemetery, Doneraile, Co Cork. The Mass will be celebrated by Father Aidan Crowley, PP, Doneraile with concelebrants Ven Archdeacon Gerard Casey PE and Father Martin Heffernan PE. Saint Mary’s Church, Carrigtwohill, Co Cork will host a dawn Mass in the graveyard at 5.45am on Easter Sunday. A Dawn Mass will take place in Shanagarry graveyard at 5.30am. In Blarney there will be a Dawn Mass in Waterloo at 7.00am. Easter Sunday Dawn Mass will take place in the grounds of the Sacred Heart Church on the Western Road, Cork, beginning at 6.15am on Easter Sunday morning. All are welcome to take part in this special celebration. A Dawn Mass will also be celebrated at the Marian Hall, Ballinhassig, Co. Cork at 6.00am. All welcome. Lavey Parish: Dawn Mass will be celebrated this year at 5.00am in the parochial grounds. Refreshments will be served in the grounds after Mass. Newbridge Parish: Saint Conleth’s Parish Church gardens in Newbridge, Co Kildare at 6.00am. There will be a Dawn Mass in Kilmurry Cemetery, Crossmolina at 6.00am. There will be an Easter Sunday Dawn Mass in Ilaunamanagh Cemetery, a breathtaking view over the Shannon Estuary in Shannon Parish, at 5.45am. There will also be a Dawn Mass at Two Mile Gate at 6.00am. Saint Nicholas (Westbury): 5.30am Shannon fields. Kingscourt Parish will be hosting its 10th annual Dawn Mass on Easter Sunday morning. The Mass will be celebrated at the Mass Rock on Lough an Leagh Mountain at 5.55am. Breakfast afterwards supplied by the local ladies. Lough an Leagh Mountain is located in east Cavan between the towns of Bailieborough and Kingscourt. A Dawn Mass for Easter Sunday will take place at 6.00am at the ancient Murrisk Abbey Co. Mayo, on the shores of Clew Bay, nestled beneath Croagh Patrick. Sunrise is at 6:25am that morning in Murrisk so hopefully weather permitting there will be an opportunity to witness the sun of Easter Sunday rise through the East Window of the Abbey after Mass. For those attending the venue is opposite the Croagh Patrick car park. It is advisable to park in the Croagh Patrick main car park in Murrisk and walk across the road by the National Famine monument down the short distance to the Abbey. Additional dawn Mass listings will be added here as we receive the information. Notice to those attending dawn Masses: Please check local parishes for more information on venues. People travelling to Masses are asked to arrive on time. Please bring warm clothing, a folding chair or stool (for your own comfort) and where possible share transport in order to assist with parking at venues.